Tá an scannán Green Book bunaithe ar an bhfíorscéal faoi fhear gorm a bhí ag tabhairt camcuairt ar na stáit i ndeisceart na Stáit Aontaithe sna 1960í nuair a bhí ciníochas an-chomónta. Bhí sé stiúrtha ag Peter Farrelly agus bhí sé ainmnithe don a lán duaiseanna. Is iad Viggo Mortensen agus Mahershala Ali na príomhaisteoirí sa scannán seo. 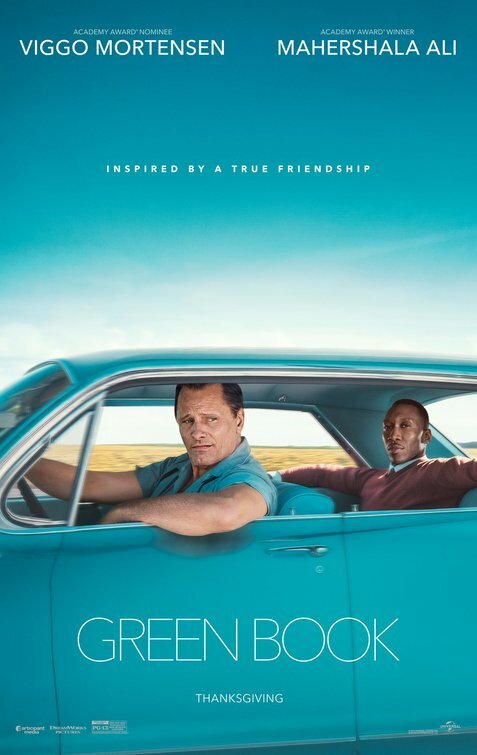 Nuair atá Tony Lip (garda cosanta Iodáil-Mheiriceánach) fostaithe ag Dr. Don Shirley, chun dul ar turas leis, tá orthu braith ar an “Green Book” chun fanacht sábháilte. Sa leabhar sin, tá liosta de na háiteanna atá sábháilte do Afrai-Mheiriceánaigh. Níl dabht ar bith ach go bhfuil an bheirt acu an-difriúil óna chéile ach tá orthu síocháin a dhéanamh. Níl aon amhras go bhfuil an aisteoireacht thar bharr sa scannán ach níos tábhachtaí ná sin, tá an scéal go hiontach freisin. Tá sé mothuchánach agus simplí. B’fhéidir go bhfuil sé ró-shimplí in áiteanna, ach é sin ráite, tá sé éifeachtach agus is scannán maith é gan dabht ar bith.